DOE vs. EIA: Who Should You Trust on Wind Energy? Last week, the U.S. Energy Department released a report on the future of America’s wind industry. The report, Wind Vision, offers a lofty goal: wind energy could supply 35 percent of U.S. electricity by 2050 (for context, wind currently supplies 4.5 percent and coal is our largest electricity source at 39 percent). At nearly 300 pages, this report makes a lot of claims. One thing worth pointing out is that Wind Vision’s findings, written by DOE’s Wind and Water Power Technologies Office, are at odds with more realistic models of the Energy Information Administration (EIA), DOE’s independent statistical office. More specifically, DOE’s wind office highlights its highly aspirational and unlikely model, while burying EIA’s more modest and realistic model of wind’s likely growth potential. Therefore, Wind Vision should be treated more as a press release for the wind industry than a realistic assessment of future energy trends. The problem: EIA, an independent office within DOE, reaches dramatically different conclusions about wind energy’s likely potential. As the statistical arm of DOE that operates independently of the agency’s policy agenda, EIA produces DOE’s Annual Energy Outlook (AEO). EIA’s most recent AEO shows that Wind Vision is likely overly optimistic about wind’s growth potential over the next several decades. Consider the following chart buried on page 34 of the Wind Vision report. DOE’s wind office reproduced EIA’s AEO data which predict that all renewables—including hydro, wind, solar, biomass, and other sources—will account for just 16 percent of U.S. electricity generation by 2040. Wind comprises just 4.8 percent of total electricity generation in 2040, according to EIA. That stands in stark contrast to the 35 percent figure in 2050 claimed by DOE’s wind office. Although the Study Scenario does not precisely replicate the prior BAU or related sensitivity outcomes, aggressive wind cost reductions (land-based wind LCOE reduction of 24% by 2020, 33% by 2030, and 37% by 2050 and offshore wind LCOE reduction of 22% by 2020, 43% by 2030, 51% by 2050), high fossil fuel prices (e.g., $3/MMBtu coal price and $7/MMBtu electric sector natural gas price), or various combinations of the two could support the level of wind penetration achieved in the Study Scenario. There’s nothing wrong with using statistical models to make predictions. But the only way DOE can come anywhere close to its 35 percent wind figure is by assuming “aggressive wind cost reductions” and “high fossil fuel prices.” That is purely an aspiration. It flies in the face of over a hundred years of historical precedent in which wind has been prohibitively expensive compared to fossil fuels. 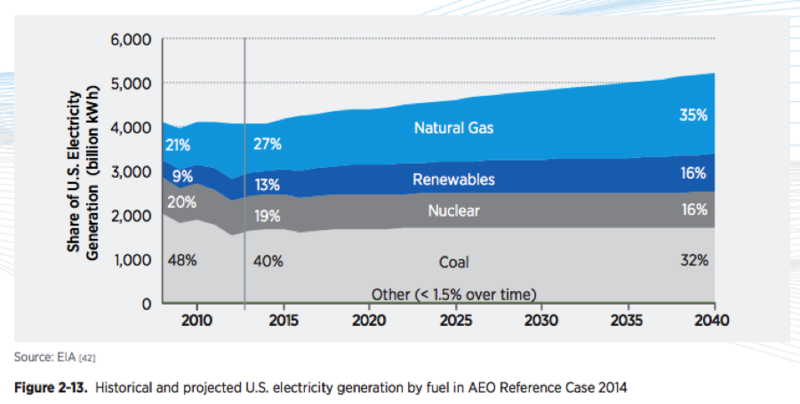 It also contradicts EIA’s realistic assessment of future energy trends. DOE’s Wind Vision report highlights its aspirational model and buries EIA’s more realistic model. Unlike EIA’s model, Wind Vision is informed by the aspirational political goals of the Obama administration, not by a realistic assessment of future energy trends. DOE’s Wind Vision should be treated more as a press release for the wind industry than “credible scenario” for wind energy’s growth potential. See Table A8 and Table A16 for generation data. EIA projects wind will generate 250 billion kilowatt-hours out of 5,219 total billion kWh in 2040.